A rather peculiar creature that was born as a mad scientist's experiment. Sora found Stitch when he was exploring Ansem's castle, and he was the one who caused Sora, Donald and Goofy to be arrested and brought into Tron's world inside Ansem's computer. 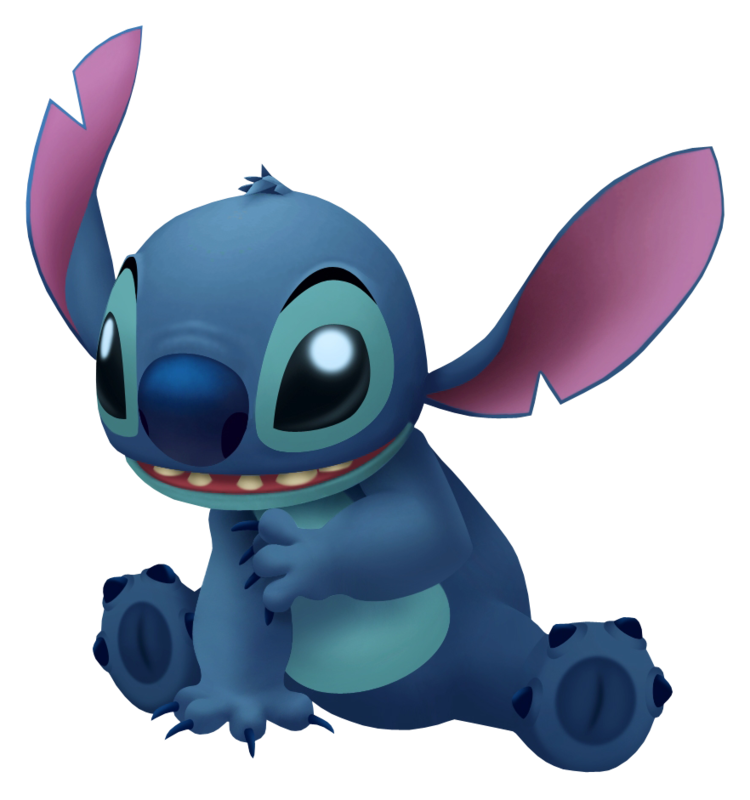 Stitch is rather a friendly fellow, and despite starting off on the wrong foot, he became fast friends with Sora. Both eager and able to land a hand, Stitch always answers Sora's call when he needs him, and also helped protect Hollow Bastion when the Heartless invaded it. Experiment 626 is Dr. Jumba's latest genetic experiment programmed only to destroy and wreak havoc. His small body does not limit his strength as he is able to lift objects a multitude of times his own weight. Experiment 626 may have been programmed with only evil intentions, but he quickly breaks out of this mold when he encounters Terra, Ventus, and Aqua. Experiment 626 is actually very kind, loyal, though sometimes a bit mischievous. When Terra arrives upon the Deep Space spaceship he releases an imprisoned Dr. Jumba in order to find Experiment 626. Terra and Jumba quickly find Experiment 626 contained in an experimentation pod. However, he is soon released when Jumba explains Experiment 626's power and then proceeds to drop the pod into some water. Experiment 626 soon takes interest in Terra. When Experiment 626 steals Terra's Keyblade wielder good luck charm, Terra pleads with 626 to return it. Jumba laughs at Terra's attempts but is taken aback when Experiment 626 actually does return the charm. Later on, Terra crosses paths with Experiment 626. Terra tries to reach out to 626 but is cut short when the ship's alarms go off. When Aqua arrives in Deep Space, she finds an object that looks strangely like one of the good luck charms she made for herself, Terra, and Ventus. Experiment 626 snatches the charm away and gets angry at Aqua, only when he notices Aqua's keyblade does he back off, fleeing from the approaching Gantu. Later, when Aqua is given the mission to capture the escapees 626 and Jumba, she stumbles upon a chamber where Experiment 626 is surrounded by Unversed. Aqua rescues Experiment 626 at which point he flees, but not before uttering one word: ‘Terra'. Experiment 626 returns the favor by fighting beside Aqua against Gantu. By the time Ventus arrives at Deep Space, 626 has been recaptured by Gantu. Experiment 626 fools the targeted laser guns to help him escape. As Ventus pursues the large Unversed that attacked him, he runs into Experiment 626 and learns that he knows of Terra and Aqua by examining his good-luck charm. 626 then attempts to follow Ventus, but Ventus asks that he stays behind. As 626 is waiting in a chamber, Gantu appears and destroys 626's charm. Experiment 626 then shows up as Ventus finally catches up with the Unversed he was pursuing and aids Ventus in battle. Ventus and 626 escape Gantu at last. Experiment 626 steals a red police spaceship and flies off to Radiant Garden where he will later meet up with Sora in Kingdom Hearts II.